- Ticket sales for all guests will open on January 22 (both online and at the UCLA Central Ticket Office). The online link to purchase tickets can be found at https://tinyurl.com/PearlZakaria. 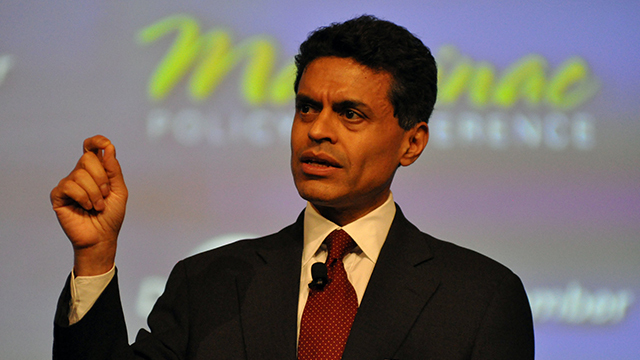 Host of CNN’s Fareed Zakaria GPS, contributing editor at The Atlantic, and Washington Post columnist FAREED ZAKARIA is widely respected for his thoughtful analysis and ability to spot economic and political trends. Esquire magazine described him as "the most influential foreign policy adviser of his generation." Fareed Zakaria GPS, CNN’s flagship international affairs program, has become a destination for those seeking smart commentary and civil conversation about the big ideas and global challenges of our time. Winner of a 2012 Peabody Award, the Emmy-nominated GPS features Zakaria’s fascinating panel discussions and one-on-one interviews with heads of state, intellectuals, and business leaders. His columns and cover stories — ranging from the future of the Middle East and America’s role in the world to the politics and culture of the global economy — reach millions of readers. Zakaria’s international bestseller The Post-American World is about the “rise of the rest,” analyzing the growth of China, India, Brazil, among others, and what it means for the future. The New York Times called it “a relentlessly intelligent book,” while the Boston Sunday Globe wrote, "Zakaria...may have more intellectual range and insights than any other public thinker in the West.” His previous New York Times bestseller, The Future of Freedom, has been translated into more than 20 languages and was called “a work of tremendous originality and insight” by The Washington Post. Born in India and educated at Yale and Harvard, where he received his PhD, Zakaria became the managing editor of Foreign Affairs at 28. He was the editor of Newsweek International from 2000 to 2010 and Editor-at-Large at TIME from 2010 to 2014. A favorite guest over the years on programs such as The Daily Show, Charlie Rose, and The Colbert Report, Zakaria is known for his good humor, wit, and unique approach to international relations that combines the knowledge of a historian and the theoretical command of a political scientist. Zakaria serves on the board of the New America Foundation. He has won the Deadline Club Award for Best Columnist, a National Magazine Award, two Overseas Press Club Awards, and the Padma Bhushan. His work has appeared in The New Yorker, The New York Times, The Wall Street Journal, and Slate. Foreign Policy magazine named him one of the Top 100 Global Thinkers. His latest book, In Defense of a Liberal Education, debuted at #6 on The New York Times best sellers list in April 2015. KAL RAUSTIALA is professor at UCLA School of Law and the UCLA International Institute, where he teaches in the Program on Global Studies. Since 2007 he has served as director of the UCLA Ronald W. Burkle Center for International Relations. In 2016 he was elected Vice President of the American Society of International Law. Professor Raustiala's research focuses on international law, international relations, and intellectual property. His recent publications include "Governing the Internet," American Journal of International Law (2016); "Fake It Till You Make It: The Good News About China’s Knockoff Economy,” Foreign Affairs, (July/August 2013); “NGOs in International Treaty-Making,” in The Oxford Guide to Treaties (2012); and Does the Constitution Follow the Flag? The Evolution of Territoriality in American Law, (Oxford, 2009). His most recent book, The Knockoff Economy: How Imitation Sparks Innovation (Oxford, 2012), written with Christopher Sprigman of NYU Law School, has been translated into Chinese, Korean, and Japanese. A graduate of Duke University, Professor Raustiala holds a J.D. from Harvard Law School and Ph.D. in political science from the University of California, San Diego. In sponsoring the Daniel Pearl Memorial Lecture Series, the Burkle Center for International Relations celebrates the memory of Daniel Pearl as a prominent journalist who dedicated his life to bringing joy and understanding to the world. Past presenters have included David Remnick of The New Yorker, Leon Wieseltier of The New Republic, Christopher Hitchens, CNN's Anderson Cooper, David Brooks and Thomas Friedman of The New York Times, ABC’s Ted Koppel, CBS’s Jeff Greenfield, Daniel Schorr of NPR, and CNN's Larry King, former Secretary of State Dr. Condoleezza Rice, CNN's Christiane Amanpour, Ambassador Samantha Power and most recently Pulitzer-Prize winning journalist Bret Stephens.